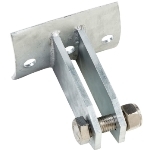 This selection of Support frame crossbar brackets are for use when installing a simple A-frame or any frame that uses a crossbar. Once you have drilled your holes, feed the rolled and fused end of the wire through the bigger and centre hole from the back of the support bar. When you have pulled all the wire through the hole, you can then connect the thimble eye in wire with the bolt in the bracket. 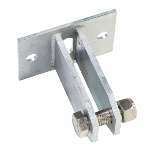 You can then fix your Support Bracket to the crossbar via the two other fixing holes, to the back end. Studding Rods or Fixing bolts are NOT included and are something you will need to buy from a good Hardware store.